The CBO released its “score” last night for the latest iteration of the House plan, the one they rushed to pass before the CBO could provide analysis – one suspects because they knew the effects would be ill (here’s one write-up; there are of course many). Surprise! It would push 23 million Americans out from under the health care umbrella, save $119 billion over ten years and “destabilize individual insurance markets in some states, leaving unhealthy Americans unable to buy insurance.” The uninsurance rate would jump from 10% to something north of 18% (i.e., more uninsured people than before Obamacare kicked in). Every one of our Illinois House Republicans voted for it; all Democrats voted against it. 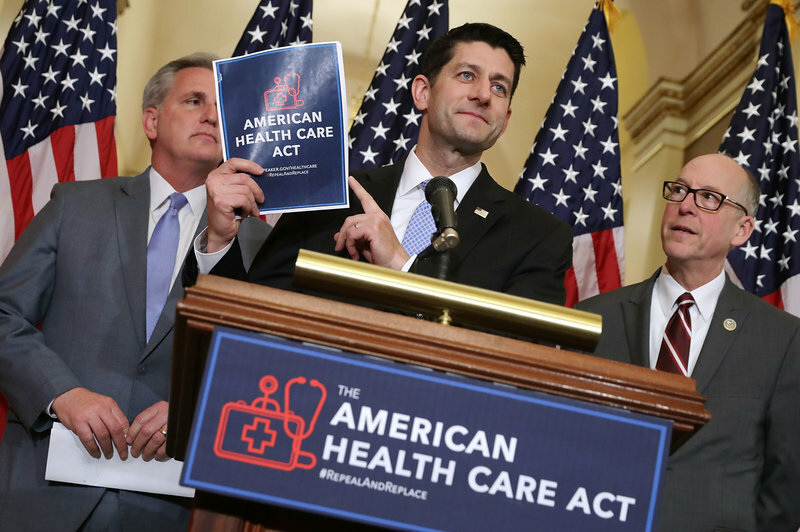 That’s what the nonpartisan Congressional Budget Office reported Wednesday in its latest score of the American Health Care Act. The CBO’s assessment shows that the deficit would fall and premiums would fall for some Americans, but the report also raises potential concerns about the bill. The agency reports that the bill could destabilize individual insurance markets in some states, leaving unhealthy Americans unable to buy insurance. The $119 billion deficit reduction represents a decline from previous versions. When the CBO first scored the AHCA, it said the plan would save $337 billion over 10 years. Later revisions reduced those savings to $150 billion. By far the biggest savings would come from Medicaid, which serves low-income Americans. That program would face $834 billion in cuts. Cutbacks in subsidies for individual health insurance would likewise help cut $276 billion. But those are offset in large part by bigger costs, including the repeal of many of Obamacare’s taxes. Those tax cuts would overwhelmingly benefit the highest-income Americans, the Tax Policy Center, a Washington think tank, reported on Wednesday. The increase in the number of uninsured is also slightly lower than in the CBO’s initial estimate. That report estimated that 24 million fewer would be insured in 2026 if this bill were to become law, putting the uninsured rate at around 18.6 percent. This revised bill would reduce that by around 1 million — a difference of less than half a percentage point. In contrast, the uninsured rate in 2026 would be around 10 percent under Obamacare, the CBO reports. More than half of that increase in the uninsured — 14 million — would come from reduced Medicaid enrollment.